Back in the 70s, before D&D became Advanced, TSR hadn't caught on to the idea of pre-written adventure modules yet. 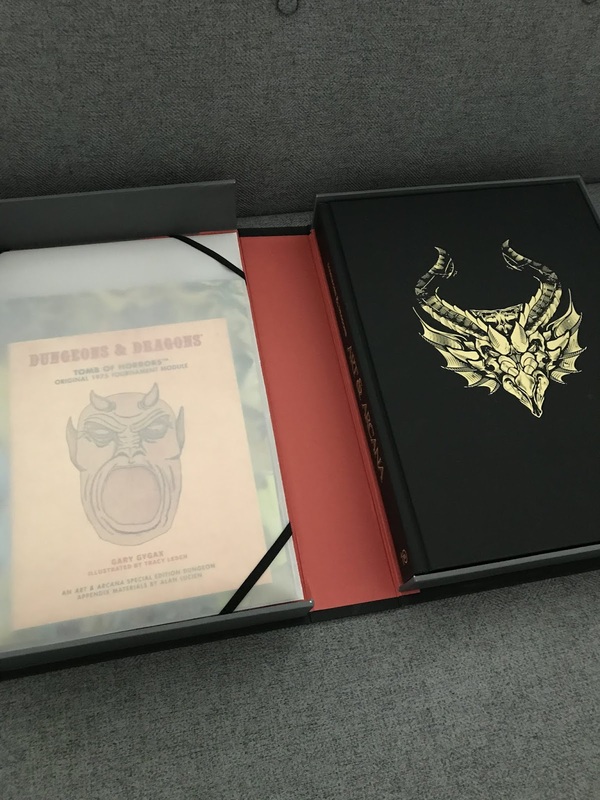 Instead, they released several "toolbox" accessories - a few sets of "geomorphic" maps (little map-sections that could be combined in a large variety of ways) for both dungeons and towns, and three sets of pre-rolled monsters and treasures, covering dungeon levels 1-9. The former are interesting in their own right, both because the style of the maps shows an earlier conception of dungeons as intricate maze-like spaces that had already fallen out of fashion before the turn of the next decade, and because each of the sets included a few colorful sample encounters that seemed to provide a taste of what play was like in Greyhawk Castle. 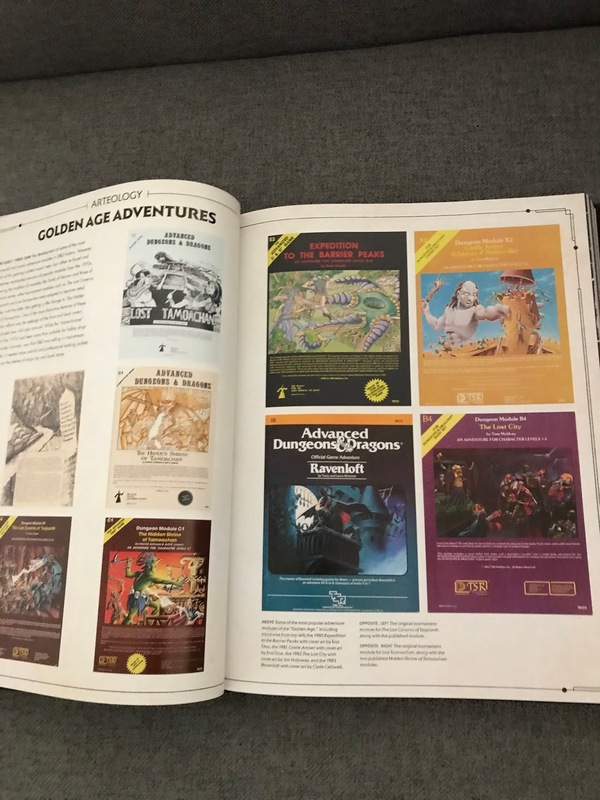 Maybe someday I'll talk more about those here (even though they fall outside of my primary focus on 80s-era D&D), but for the time being I'm focused on the latter product - the three Monster and Treasure Assortments released by TSR in 1977 (sets 1-2) and 78 (set 3), right on the cusp between Original and Advanced D&D. To be honest, there's really not much to these products. 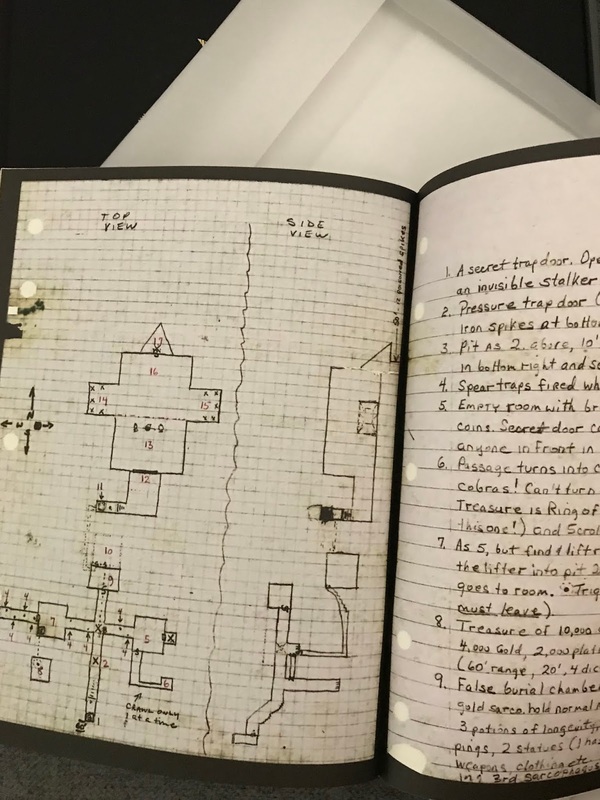 Each of them was a set of 8 cardstock sheets, three-hole punched, unbound, that included 100 pre-rolled monster encounters and 100 pre-rolled treasures for each of three dungeon levels (set one had levels 1-3, set two levels 4-6, and set three levels 7-9). There's a bit of historical curiosity because they (the first two sets, anyway) were released before the AD&D Monster Manual so they give full stats for various animal types that were mentioned but not detailed in the original rules, some of which are different than the AD&D versions, and also because they include a bunch of creatures that were probably mysterious to the audience at the time - not only monsters from the various D&D supplements, but also various creatures that appeared in The Strategic Review (TSR's house-organ newsletter that later evolved into Dragon magazine) and even the super-limited distribution Lost Caverns of Tsojconth tournament dungeon written by Gary Gygax but published by the Metro Detroit Gamers. 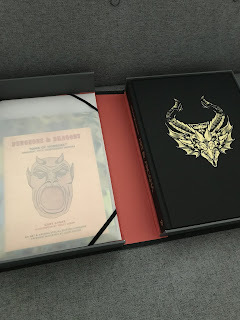 However, they're fun to me, like all of the Original D&D stuff - the geomorphic sets, the early magazines, and third party products from the likes of Wee Warriors and Judges Guild - because they're a glimpse into an era that had already long since disappeared by the time I started playing D&D in 1984. 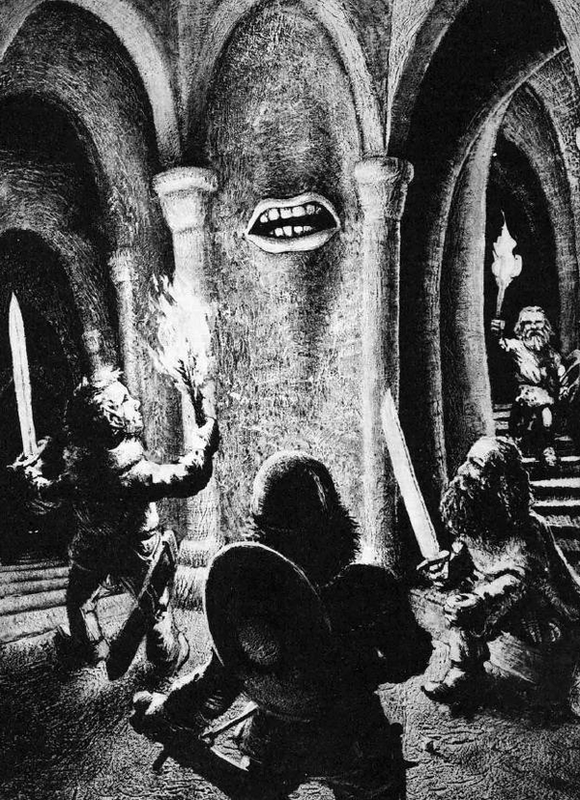 This was the era of the "funhouse dungeon" where randomness was not just accepted but expected, and the game seems to have been treated much close to something like a traditional wargame than what it eventually became, with more of a focus on worldbuilding and storytelling and things that tried to make sense. 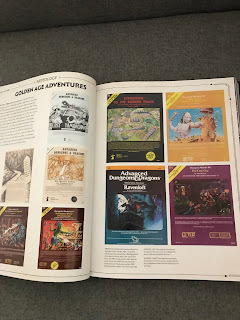 These products offer some of the few published glimpses we get (outside of the rulebooks themselves) of the era when D&D was just about the referee (the term "dungeon master" hadn't been coined yet) drawing a map of a maze, filling it with monsters, traps, and treasures, and a group of adventurers going in to explore it and get rich or die trying. It didn't matter how the monsters got there or why they didn't eat each other or where the treasure came from, it was all just accepted as the premise of the game. And in that context, lists of 100 random monsters and 100 random treasures make sense. Combined with the geomorphic maps, it's almost everything you need (the individual referee had only to supply his or her own tricks and traps). 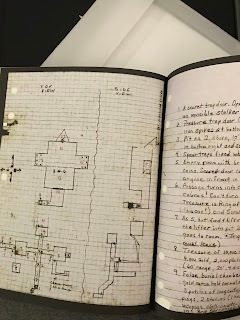 So I've always kind of liked looking over ands studying these things, and trying to figure out how they were made and if there are any interesting hidden patterns, any lessons that other DMs could learn about what TSR c. 1977 saw as being appropriate challenge-levels and treasure rewards for characters of various levels (remembering that in the early conception of the game dungeon level was supposed to be equivalent to character level - so 4th level characters were balanced against the challenges and rewards on dungeon level 4, and so on). 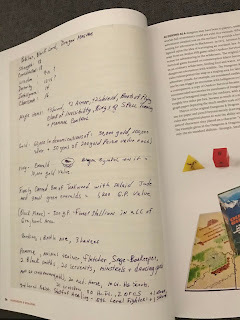 Gary Gygax's son Ernie says that he rolled up everything in these products from tables as an after-school project, which is believable - the results certainly seem random - but also intriguing (at least to me) because they're definitely not the product of any published tables. A dozen or so years back I did an exhaustive listing of all the monsters for all nine levels, noting on which levels and in what quantities by level each of them appeared. The results seem fairly close to what you'd see from the Random Encounter Tables in the back of the AD&D Dungeon Masters Guide (though not exactly, since those tables include "new" monsters introduced in the AD&D Monster Manual that weren't present here) which makes it likely that Gary had given his son an early draft version of those tables to work from. The most interesting takeaway is how the number of monsters of each type changes depending on which level they're encountered on - a single "overpowered" monster may appear on one level, a small group (say 1-4 or 1-6) on a lower level, and a large group (say 2-20) on a much lower level. Even deep in the dungeon monsters like orcs and giant rats still show up on the lists, but in groups of 5-50 or 6-60. All of that data is preserved at the Knights and Knaves Alehouse message-board if anyone's interested in taking a look. At the time I never got around to doing a similar analysis of the treasures lists, which is what brings me here now. 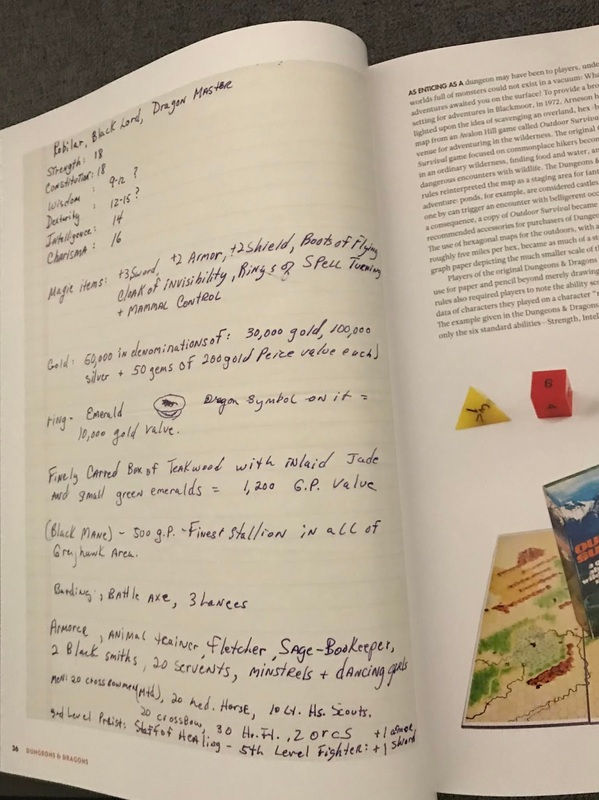 One thing that's immediately clear is that the lists are not based on the guidelines for random treasure hoards in D&D Volume III. 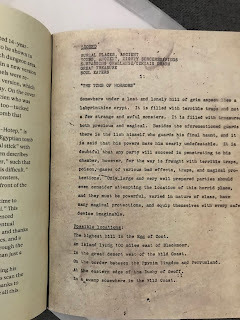 In searching to see if I could find anything else they might have been drawn from, I came across the Solo Dungeon Adventuring rules published in issue #1 of The Strategic Review (and later reprinted as Appendix A of the AD&D Dungeon Masters Guide). The way that table produced treasures of a single type (i.e. one type of coins, or gems, or jewels, or a magic item, but not mixed together) and the proportions between them - the low value coins the most common, higher value stuff less common - looked similar. And, lo and behold, at least for the first three levels when I tallied up and compared them the results were really similar (not exact, but that's because Ernie was presumably actually rolling the dice each time rather than just using the statistical values). So this was almost certainly the table Ernie used. However, on the later levels some anomalies appeared - magic items became way more common than the table would allow (3%), and mixed hoards of coins start appearing on the lower levels. Plus, while that table gives a fixed number of coins per level - 1000 CP or SP, 750 EP, etc. - these tables showed more variation (but, notably, only within the last thousand - i.e. instead of 4,000 SP on dungeon level 4, you see anywhere from 3,100-4,200). These latter values may have just been chosen to provide an illusion of variety, but since they generally seem to align to dice-ranges, I suspect they may also have been rolled. 5% chance per level the treasure is a magic item, up to a maximum 25% at levels 5 and higher. The adventure doesn't exist in a self-contained vacuum, but is connected to a larger milieu. Opposed factions and organizations are important, both on the largest cosmic scale (the alignments are not just personality descriptors but cosmic "teams" - the gods (and demons and devils) are not abstract but real and actively, directly concerned in the affairs of mortals) but also on the more mundane scale via guilds (including those of thieves and assassins) and other organizations (the intertwined brotherhood of druids, rangers, and bards, knightly and monastic orders, etc.). The actions of the player characters need to consider and interact with all of these larger-scale factors, and will be influenced by them both positively (pledging loyalty and service in exchange for aid and support) and negatively (making long-term, recurring enemies). The overall situation of the world is, effectively, a loose strategic stalemate but the forces of cosmic evil have a small but growing advantage and if everything continues on its current trajectory will eventually win and the mortal world will be destroyed. Thus the actions of the player characters are consequential - they are the ones who are tasked with ultimately turning that tide and making a difference, and no one else (no organization of non-player characters) is going to do it in their place. Tied in to this is the fact that as-written the adventures are always hard for the PCs. In terms of pure statistical analysis they are doomed and can't rely on the dice alone to see them through to success, so it becomes incumbent upon the players to do clever things and figure out ways to change the situation in order to overcome or circumvent the inexorable math. This is the key to "good play" in Gary's conception of the game - not just making the right moves, but figuring out new moves. The characters (at least the significant ones) are cosmopolitan and sophisticated in their attitudes - not only are they comfortable among mixed races and cultures, they're also assumed to have at least some knowledge of how magic works and the nature of the multiverse. Travel to other worlds and planes is commonplace, and so is at least broad familiarity with modern-day earth (including references to "anachronistic" earth culture). The world is in "medieval drag" as far as technology and style of dress, but most attitudes (including patterns of speech) are much closer to contemporary society than to the actual historical medieval period. 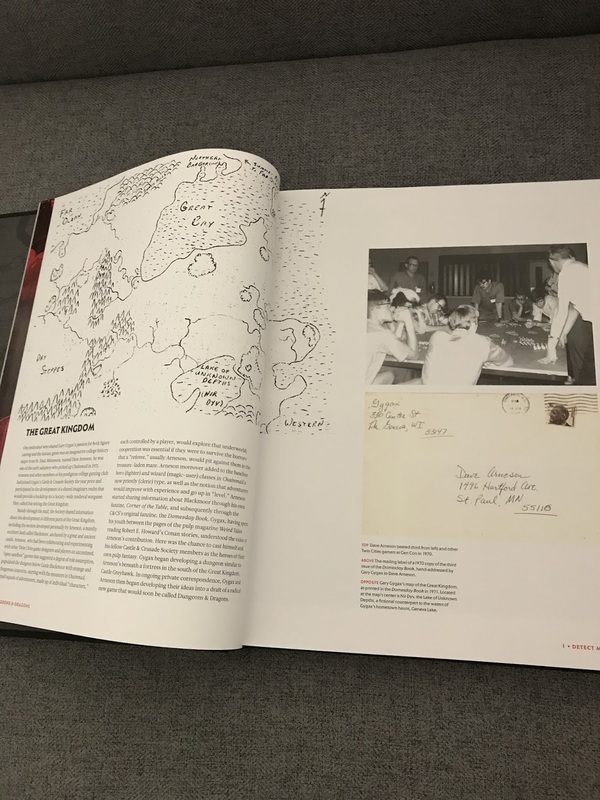 The adventure locations themselves exist in a "de facto" state that is not limited strictly to the context of the scenario in which it is presented. While most of Gary's adventures (especially those that were run as tournaments at conventions) start with a defined "mission" explaining why the player characters have come to this particular place and what they're trying to accomplish there, the description of the location itself doesn't depend on that and could be used in a totally different context, encountered by a group on a different mission or even no mission at all - it could be stumbled upon completely at random. 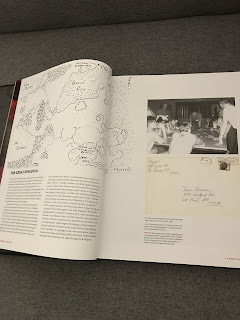 This makes the adventures less linear and limited, more expandable, more rational (because the contents of the locations generally make sense within their context and don't exist solely for the purpose of being "an encounter" for a group of PCs), and imparts a sense of belonging as parts of a greater whole - these aren't just challenges being placed in front of the players but are "real" locations that exist within the fantasy world and would exist whether or not the players visited them. I could go on and on, but I think the above is a pretty good encapsulation of what I have in mind when I think of "Gygaxian spirit," apart from the obvious surface-level details (his detailed descriptions of locations and treasures, his particular Thesaurus-driven vocabulary, his focus on present-tense action rather than irrelevant history and backstory, etc.). Another big info-dump post. Here's a list I compiled of all the languages mentioned in the World of Greyhawk set and the various AD&D monster books (where creatures are mentioned as "having their own language"). The initial idea behind this was to come up with a more comprehensive version of the Random Language Determination table on DMG p. 102 but there ended up being so many languages to render that impractical (at least for the moment). So instead of a table I'm just presenting it as a raw list. I drew a distinction between Ancient Baklunish (as described in the WOG Guide p. 16) and modern Baklunish (per the table on the WOG Glossography p. 31). The "Human Foreign Languages" were all made up by me, based on various off-map lands mentioned in Gary Gygax's Gord novels. The "common" non-human languages are the nine listed on p. 34 of the Players Handbook plus the three additional languages (bugbear, gnome, hill giant) that have a 2% or higher occurrence on the DMG p. 102 table, which seemed like a reasonable standard. 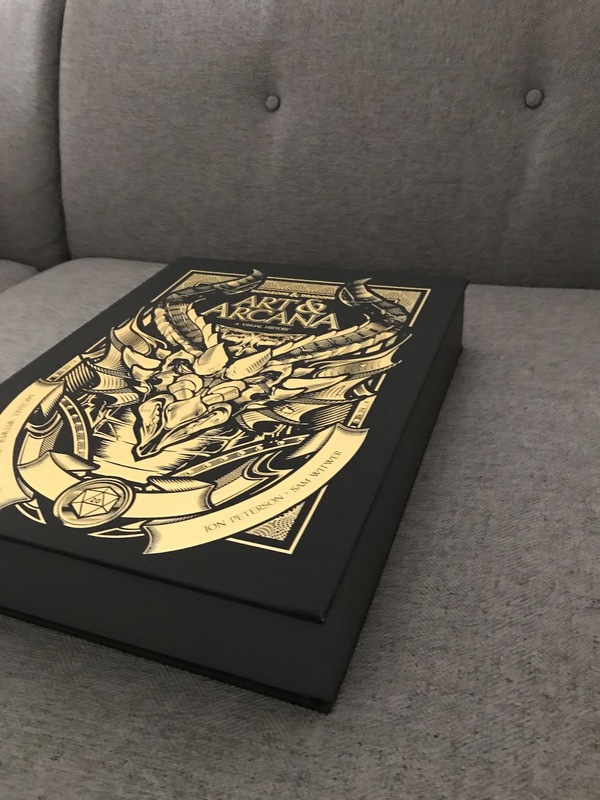 The "uncommon," "rare," and "very rare" lists are based on the monsters' Frequency (with common monsters that don't fit the above criteria included on the uncommon list). Non-human languages with asterisks are those included in the table on DMG p. 102. 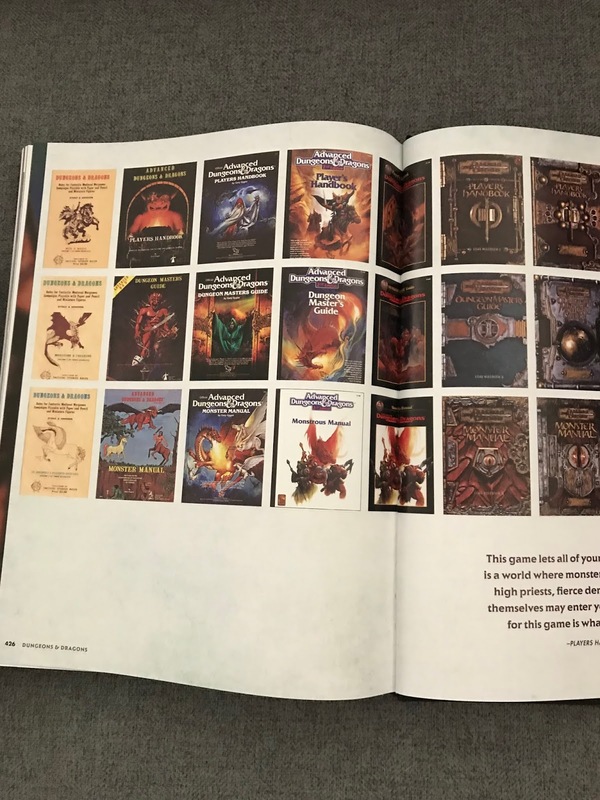 Non-human languages in parentheses are not mentioned in the books but I'm assuming based on the nature of the creatures that they probably have their own language (and note that the DMG p. 102 table includes several monster-languages that aren't mentioned in the Monster Manual: ettin, gargoyle, manticore, naga, salamander, and xorn). The other-planar languages are mentioned in the books and are not specific to one monster; based on these it can probably be extrapolated that each Outer Plane has its own Common language (that presumably, like the modron language as described on MM2 p. 86, is related to that plane's corresponding Alignment Language(s)). Various monster descriptions mention the ability to speak with types of animals - burrowing mammals, woodland animals, snakes, birds, fish, etc. I chose not include any of these as languages per se. In Gary Gygax's Gord the Rogue series of novels depict the city of Greyhawk as a great, teeming metropolis, comparable in scale and atmosphere to both Fritz Leiber's Lankhmar and Victorian London as depicted in the novels of Charles Dickens (combined almost certainly with touches of the real-life Depression-era Chicago of Gary's own childhood). In the novel City of Hawks he even included a schematic map of the city showing its various districts and neighborhoods, with a scale that indicated the city covers an area of about 30 square miles - roughly seven miles north to south by 4-5 miles east to west. As I've mentioned previously, Gary describes the city in a way that makes it feel really alive, from the reeking Slums to the glittering High Quarter, with many other areas in between. The city feels almost impossibly, immeasurably large, truly the center of its own self-contained universe. 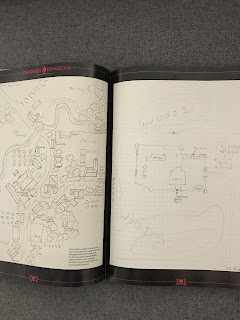 The depiction of the city is by far the best thing about those novels, and it seems almost impossible to me that a D&D player would come away not wanting to use it as a central location in the game (with the fact that it was never detailed in print - and no, the version TSR released post-Gary emphatically does not count! - isn't really an obstacle, precisely because the city is so bi; it can't really be mapped or fully detailed - just use the large-scale district map and at the local level do whatever you want). And yet, when you look up the entry for Greyhawk City in the World of Greyhawk, you see it listed with a population just over 50,000 (depending on which version of the set you're looking at - it's 53,000 in the original 1980 folio, increased slightly to 58,000 in the 1983 boxed set). That is, to put it mildly, not a teeming metropolis as described in the novels. And that's not just me applying unrealistic modern standards (like it being about half the size of the mid-sized city I grew up in) - in the medieval period there were many cities in Europe and the Near East with populations of 100,000 or more. Even the random city population size table for the World of Greyhawk that Gary included in Dragon #101 generates populations of up to 96,000, which puts Greyhawk's population as just about the middle of the range. In order to plausibly feel like its portrayal in the novels (and fill up those 30-odd square miles of space) Greyhawk City needs a population of at least several hundred thousand people. That the "official" population figure doesn't actually reflect the entire population - leaving out garrisons, criminals, foreign enclaves, and other such marginal groups - isn't enough to make up the difference. But, having decided to increase the population of Greyhawk City, that creates another issue - if Greyhawk City has a population of around half a million, then the population figures for almost everyplace else in the World of Greyhawk become too low - Greyhawk City shouldn't have a higher population than the entire Kingdom of Furyondy, or the County and Duchy of Urnst combined. 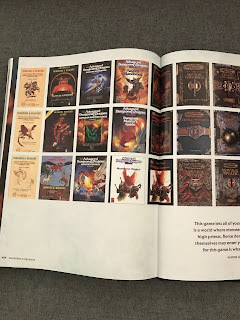 Thinking about this and a couple of Google searches showed me that the anomalously low population values of the World of Greyhawk have been a point of contentious discussion in the fan community for a very long time, and in particular a lot of virtual ink was spilled on this topic a few years ago in the D&D blogosphere. So it's not just my imagination - compared to, for instance, Europe in the middle ages, the published population figures are around 5-10x lower than what would be expected, and when we consider that the Flanaess is actually quite a bit larger than continental Europe, the population density is even lower than that, with even "central" civilized regions having about 5 people per square mile (compared to anywhere from 50-100 in medieval Europe). Those old blog-conversations (and the message-board thread where I brought this up a few weeks ago) offered some justification for those low values - from the "not everybody is counted in those figures" argument again, to various notions of the need for low populations to allow for "adventure-able" frontiers and manageable/wargame-able state-level conflicts, and the notion that in a world that includes both real magic and real monsters the population might stabilize at a low level, further afield to claims of the World of Greyhawk being a de-facto "post-apocalyptic" setting where hard-pressed pockets of civilization are under constant threat of imminent collapse and even the ostensibly-civilized areas are really little more than howling wilderness. While those arguments are all reasonable enough to allow somebody who wants to stick with the published population values to do so, they don't really do it for me. For one thing, because the World of Greyhawk isn't really depicted as a wasteland on the knife's edge of total collapse, for another because most of those arguments and justifications would still apply with a population 3-5x larger (which would still be very low compared to medieval Europe), and - selfishly - because sticking with the "by-the-book" population values doesn't address my original issue: that I want Greyhawk City to have a much larger population, but also don't want to completely throw off the implied balance of the setting. So, after having given all of this way too much thought (and justified - just like my change to the Oerth calendar - by noting that TSR already increased the population of many states between the 1980 folio and 1983 boxed set, thus undercutting any notion that these values should be treated as "sacred text" or that there was some secret justification behind them that we dare not second-guess), I created a big spreadsheet of the population values for the World of Greyhawk and just semi-arbitrarily increased them across the board. Most countries got their population increased by a factor of 5 over the folio value, some by a factor of 3, a few by less. For towns (population under 10,000) I generally increased their population by 20-40% (to better reflect the range given by Gary in Dragon #101), cities (population over 10,000) were mostly doubled (for the same reason), and the four free cities (Dyvers, Irongate, Rel Astra, and of course Greyhawk) were treated like countries (i.e. population increased 3-5x). Demi-human populations (and human woodland populations) were mostly doubled. The end result of all of this was an increase in total population from 12M to 40M, with Greyhawk City having a population of 265,000. That's still small compared to Victorian London (1M+) but about the same as Paris in the 1400s (i.e. as depicted in Victor Hugo's Notre-Dame de Paris), which I can live with. Since these numbers were all derived semi-arbitrarily based on gut feeling (which I'm fairly certain is the exact same way Gary Gygax created the original numbers) I did some further spot-checking, calculating population densities for a handful of areas (states and forests) to see what the numbers looked like and how that would affect the feel of play - whether I'd inadvertently over-populated the place. The results (which I didn't save in a convenient spreadsheet) came out okay - the ostensibly-densely-populated central states having populations of 10-20,000 per 30-mile hex (i.e. about 26 per square mile), borderland-ish states (Geoff, the Iron League states, etc.) having populations around 5,000 per hex (6/sq. mi. ), and woodlands around 1,000 (1.3/sq. mi.). Those latter two figures are totally workable, and even the former one is low compared to historical values for Europe (and is comparable to the present-day population density for some mostly-rural counties in northern California that feel anything but crowded). It does mean that the central states need more cities and towns than are depicted on the map alongside the already-assumed hamlets and villages, and that even in the borderland areas every "open" hex will be assumed to have 7 or 8 villages rather than 1 or 2. That might seem to some people like too much, but I think it's worth keeping in mind that the civilized areas, the open hexes on the map, by-and-large only matter as a backdrop. Characters are from those places, and may be in service to their rulers, and are trying to defend them from the forces of evil, and will pass through them, and may spend their between-adventures time in them, but the actual on-stage adventuring activity almost always takes place elsewhere - in the forest and hill and swamp and mountain and desert and jungle and badlands hexes that surround them - the wilderness areas that remain just as vast and sparsely-populated as they ever were. And even those adventures that do take place in the civilized lands almost by definition aren't going to be exploratory wilderness hex-crawls, but rather will center on investigations and negotiations and other such matters where, except for determining travel time from location A to location B, the map isn't even relevant. 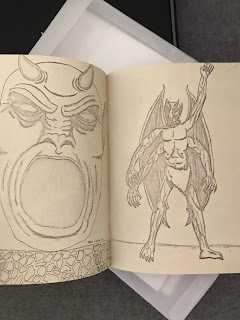 An often-overlooked section of the AD&D Monster Manual II is its index, which includes not only its own contents but also those of the original Monster Manual and the Fiend Folio, and also lists various alternative names for monsters from all three volumes in addition to the standard names. This is interesting to me, because while some of those names are included in the monster names or descriptions, many of them are not - particularly for the Fiend Folio creatures, which it almost seems as if Gary Gygax or someone else at TSR systemically renamed, perhaps as a memory aid. Because I think some of these alternate names are fun and in a few cases like them better than the standard ones (and especially like the world-building flavor of different people having different names for the same thing) and because while the index references the standard name for each alternative name but doesn't do the reverse, I decided it was a worthwhile exercise to go through the index to compile all of the alternate names and arrange them by the order of the books for easy reference. So now I can see at a glance that stirges are also called bat birds, ettercaps are sometimes known as spider-beasts, khargra are earth fish, osquips are rock rats, and so on. And, having done that work, I figured other people might also be able to get some use out of it, so I might as well share it. To start with, what we know, the in-setting author of the World of Greyhawk Guide tells us that "the Great Moon (Luna) waxes and wanes in fixed cycles of 28 days each, upon which our months are based; while the Handmaiden (Celene, the small aquamarine satellite) follows a path which shows Her in full beauty but four times each year, thus showing us the time for our Festivals. When both Mistress and Handmaiden are full, things of great portent are likely to occur." However, the Glossography tells us that Luna actually has 13 cycles in each year (because of the four week-long Festivals that occur between the 12 months) and therefore the months do not correspond to the cycles of the moon (i.e. the full moon occurs on the 11th day of the first three months of the year, the 4th day of the next three months, the 25th day of the next three, and the 18th day of the last three months). Furthermore, it also details cycles for Celene that are irregular - there are 22 days between full and 3/4, 20 days between 3/4 and new, 21 days between new and 1/4, and 28 days between 1/4 and full. The only significant detail that the Gord novels add regarding the moons is the concept of the "whole" moon - when Luna is at 3/4 and Celene at 1/4 on the same night. Under the cycles described in the Glossography, this phenomenon occurs once each year, on the 4th night of the month of Harvester. I know this is the Official calendar and it's easy enough to just use it and not think too much about it, but every once in a while despite myself I do think about it too much, and when I do I don't like it. I don't like the months not lining up with the cycle of Luna, and I don't like Celene having an irregular orbital period (and I also don't like the proposed "fixed" regular Celene cycle that means the whole moon as described in the Gord novels will never occur). What I've done to resolve those issues in my mind is to depart fairly drastically from Official Greyhawk and shorten the length of the year - in my Greyhawk calendars the four Festival weeks don't fall in-between the twelve Lunar months, but instead overlap them, so that Needfest occurs on the 26th of Sunsebb through the 4th of Fireseek, Growfest on the 26th of Coldeven through the 4th of Planting, Richfest on the 26th of Wealsun through the 4th of Reaping, and Brewfest on the 26th of Harvester through the 4th of Patchwall. Thus, the year has 336 days instead of 364. Luna is full the first night of each month, which means that Luna is always full when Celene is full (and the Dark Time/Dim Nights mentioned in the Glossography no longer exist), and the "whole moon" occurs four nights a year - on the 8th night of Coldeven, Wealsun, Harvester, and Sunsebb. At first blush this seems like a major departure, which is why I hesitated over it at first, but the more I've thought about it the more comfortable I become, especially when I recall that the 364-day-long year isn't graven in stone. In fact, in the 1980 folio version of the World of Greyhawk the year is 360 days long (with each Festival only lasting six days instead of seven). The change in the 1983 set was presumably made to make the calendar and lunar phases work out more regularly. So I'm just doing the same thing as TSR already did, and for the same reason even. I'm just doing all the way what they only did partially. Does it matter if Oerth's year is 29.25 days shorter the Earth's? Not really. Every 12th year an Oerth person is effectively one year younger biologically than an Earth person the same "age" - a small enough difference to be pretty easily overlooked, at least for me. Perhaps Oerth orbits its sun more closely than we do ours, which could help explain the long summers of the Flanaess, but might also mean the inhabitants are absorbing more solar rays leading to slighty lower average lifespans (or some other handwavey malarkey...). "Here," Curley Greenleaf said, placing down a huge sphere of uncut yellow corundum, "is the great globe of our sun. This emerald orb here is Oerth, I think; that opal represents Luna, and the star-sapphire of smaller size stands for the blue disk of Celene," he continued, placing each piece in its correct relative position. "These various stones are the spheres which accompany our world in its circuit of the sun…. These round diamonds are stars, and the little black opals the various moons and other celestial bodies whirling and spinning their pathways through the system," he concluded, not bothering to specifically place each of the smaller pieces. "What such imitations were used for is lost to us now, lads, but they represent a fortune to us all!" Or, in other words, a standard heliocentric solar system. Later in that same chapter Curley further explains that a large jacinth from that cache of gemstones "must represent the planet of Rao, greatest of the celestial spheres in the family to which Oerth belonged." This tells us that at least one of the planets is named after a Flannish greater deity. In later email correspondence, Gary reportedly told Gene Weigel that the Oerth system was intended to have ten planets total - the same nine as ours (Pluto was, of course, still categorized as a full planet at that time) plus "one beyond." Combined with the reference to the "five wandering stars" in the Guide suggests the last four planets aren't visible to the naked eye or known to laymen such as the "savant-sage," but would be familiar to experts such as the druids and worshipers of Celestian (who don't just watch the sky but actually travel in space). This isn't something that's going to be immediately relevant or useful in most games, but in the right circumstances it can add color and at least an illusion of depth - the representation of the planets as gemstones and their connection with the greater gods allows for symbols and patterns when describing temples and treasures, creating rituals, and so forth. 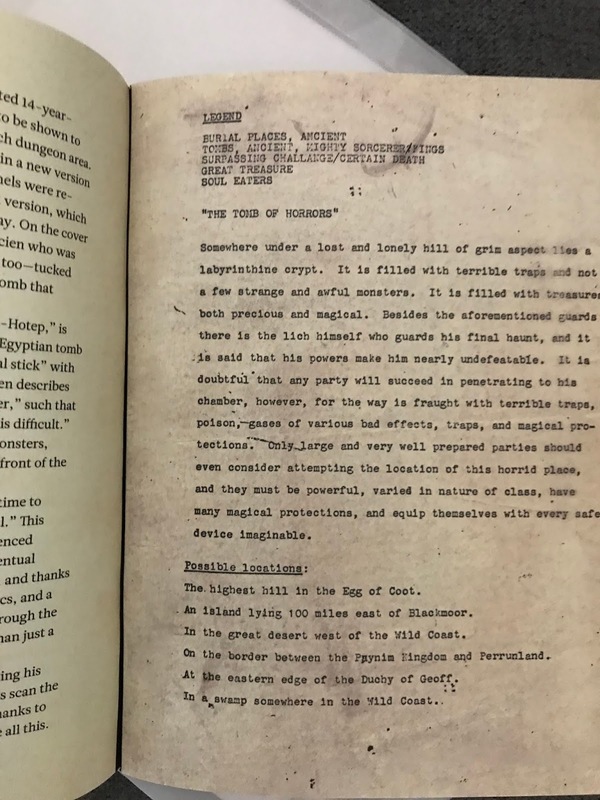 Perhaps a party of adventurers can discover some means of traveling to the red planet Ulaa and having adventures there, in the same manner that Erac's Cousin visited Mars (Barsoom) in the original, pre-publication, version of the Greyhawk Campaign. The Guide offers almost nothing about the stars, mentioning only that there are "12 Lairs of the Zodiac" through which the sun passes "in an appointed round which never varies." There's not much more in the Gord novels, only a mention (in Artifact of Evil) of a constellation called the Eldest Griffon whose extended wing points north and can be used as a navigational aid. As with the details about the planets, this isn't material that is likely to be immediately useful in an at-the-table gaming context, but it does add some extra color. More pertinently, though, because the Oerth Zodiac is intentionally close to the Earth Zodiac, it allows for the inclusion of astrology-based symbols and references without having to either expect players to familiarize themselves with an entirely new fictional astrological system or justify a distinction between in-game and out-of-game knowledge. At very least, having the Oerth Zodiac line up with ours makes The Abduction of Good King Despot more easily usable as a World of Greyhawk adventure, without having to perform mental backflips to explain its astrology-based theme and symbols. Most trade in and out of the Wild Coast region of the World of Greyhawk goes by water, through the bustling seaport towns of Safeton, Fax, and Elredd. However, some merchants also follow an overland route across the Kron Hills and through the Gnarley Forest, connecting the region with the breadbasket of the Velverdyva Valley. This route, commonly called the "High Road" (as opposed to the "Low Road" that runs along the shore of the Velverdyva) stretches approximately 200 miles connecting the towns of Verbobonc in the northwest and Narwell in the southeast. Eastbound wagons are typically loaded with foodstuffs and cloth goods intended for the inhabitants of the Wild Coast, while westbound wagons are more likely to carry goods imported from across the Azure Sea - superior food and clothing of Aerdy origin (including crates of highly-prized Sundish lilac wine) and even more exotic goods - spices, ivory, and rare wood - from further abroad. Thus, while the former traffic is greater in volume, the latter tends to be more valuable. The trip takes ten days (including one mid-trip rest day) for a wagon train. Parties on foot or horseback - be they pilgrims, refugees, adventurers, or outlaws - also use this route on occasion, and are able to navigate the hilly terrain more quickly. A party on foot can traverse the route in seven days, and a group on horseback requires only four. The Chirping Redbreast Inn (Woodsedge village: pop. 750): Night 1 (9) stop for wagon trains, night 1 (6) stop for men travelers on foot. The scenically rustic village of Woodsedge is situated at the verge between the Gnarley Forest to the north and Welkwood to the south and sees traffic from both directions. This inn is pleasant, if largely nondescript. It is generally busy with patrons coming from all directions, who are happy to trade news and gossip of their travels. The Grand Timberway Inn: Night 2 (7-8) stop for wagon trains, night 2 (5) stop for travelers on foot, night 1 (3) stop for riders on horseback. This large inn is, effectively, a self-contained fort. It is surrounded by a high palisade with two watchtowers and employs a dozen-person militia among its total staff of fifty. In addition to the inn proper, several outbuildings within the wall provide supplemental services (blacksmithing, candle-making, baking, etc.) to the innkeeper and travelers alike. The accommodations here are expensive, but most travelers consider it worth the price. Woe to those who (through excessive rowdiness, property damage, or inability to pay their bill) end up on the wrong side of the proprietors and find themselves banned from the establishment, forced to make camp outside its walls. The Windy Hollow Lodge: Night 3 (6) stop for wagon trains. This small, lonely inn sees little traffic, and even some merchant caravans will choose to make camp along the road rather than stay here. The lodge is a single dilapidated house which may have once been grand but certainly has not been that way for decades, and now smells of mold and dust. The small family who operates the place all seem dreary and listless, which also well describes the quality of the nourishments served here. Most travelers are sure the place is haunted, and those who've stayed here in the past tend to have stories of unexplained footsteps, moaning sounds, and even shadowy visions. The Homely House Lodge: Night 4 (5) stop for wagon trains, night 3 (4) stop for travelers on foot. This comfortable lodge is operated by an extended family of gnomes, though in recognition of their clientele the public eating and sleeping areas were all built at human-scale. When they learn that a group of travelers are passing through, gnomish peddlers from the nearby burrow-villages will descend upon the lodge in hopes of trading trinkets and gossip. The cuisine served here is typically gnomish - turnips, carrots, and other root-vegetables - but the gnomes brew their own beer, which is surprisingly good. The Cat's Cradle Inn: Night 5 (4) stop for wagon trains, night 2 stop for riders on horseback. This inn is operated by a pair of old widow sisters and their improbably extensive brood of 20+ children and grandchildren who are constantly scurrying back and forth on errands. The place feels underdefended (one son and two grandsons have spears and shortbows and form a feeble militia) but both women are powerful mystics (the elder, Bezequelle, is an Astrologer, the younger, Pegeen, is a Medium) who not only have placed various magical charms and wards about the place, but are also on friendly terms with and watched over by both the woodsmen and elves of the area. Should any trouble arise here one of the urchin granddaughters has been instructed to run into the woods to summon help, which will arrive 4-24 turns later in the form of a patrol of woodsmen (1-2) or wood elves (3-6). The Hillsmoor Inn (Imeryds Ford: pop. 200): Night 6 (3) stop for wagon trains, night 4 (3) stop for travelers on foot. The rustic folk of this hamlet keep their heads down and are not typically friendly with travelers during the day. At night, in the common room of the inn after their tongues have been loosened by ale, they are more willing to trade gossip (and slander) about the next village over. A pair of Footpads keep an eye on all traffic passing through (as this is one of only two fords along this stretch of the Imeryds Run) and if they spy anything unusual will report it to their boss (Gremag, in Hommlet), either by seeking to join on with the travelers (and spending the next day in further observation) or - if a group seems particularly interesting or dangerous - secretly departing on horseback during the night in order to make their report before they arrives. The villagers here know that these two (and their half-orc Warrior companion, who keeps a low profile but is available as muscle if needed) are untrustworthy strangers, but are very unlikely to share that with people who are themselves untrustworthy strangers. The Welcome Wench Inn (Hommlet: pop. 250): Night 7-8 (2) stop for wagon trains, night 5 (2) stop for travelers on foot, night 3 (1) stop for riders on horseback. Located at the crossroads of the High and Low Roads, this large and prosperous inn is renowned for its good food and excellent drink. The ostler will often attempt to purchase out of the stock of any passing merchant carrying wine or liquors to replenish his extensive cellar. A few miles east of here on the Low Road lie the ruins of the Temple of Elemental Evil, that cult of demon-worshippers who were the cause of so much mischief around these parts a decade ago. The Pig and Barrel Inn (Bywater village: pop. 850): Night 9 (1) stop for wagon trains, night 6 (1) stop for travelers on foot. Nondescript and seedy lodgings in this nondescript and seedy riverside village that always seems to smell vaguely of rotting fish. Travelers along the Low Road also frequent this inn, so despite its mediocre quality it is usually busy and travelers may be forced to sleep in the common room (30%) or barn (10%) even if they are willing to pay for private rooms - though offering to pay double or triple will see some other group consigned in their place. Encounters on the road: For the first and last days of travel, encounters should be checked normally for the Viscounty of Verbobonc or Wild Coast (respectively, depending upon the direction of travel). For the days in-between, while the road is passing through the wild woods and hills, the following table should be checked three times per day of travel (morning, mid-day, and evening), with an encounter of some sort occurring on 1 in 10. If the party stays in any of the inns above there will be no encounter checks during the night, but if they make camp in the woods instead they will be subject to three more nighttime encounter checks.